Music and children's literacy go together like well, bees and honey. A musical education can help children develop the building blocks they need for literacy. Exposure to fine music develops what Shinichi Suzuki calls "a beautiful heart." Flight of the Bumblebee is a children's picture book written by Hazel Edwards, illustrated by Mini Goss and published by New Frontier in 2009. I've reviewed another beautiful book in this Music Box series, Dance of the Sugarplum Fairy, by Sue Whiting and Sarah Davis. My copy is accompanied by a bonus CD, set into the cover, and beautifully read by Antonia Kidman. This is an excellent storage idea - the CD, in its strong transparent case, is part of the cover art work, and can readily be found if it's put back into the book after playing. As well as Kidman's excellent interpretation of Edwards' characters, the CD provides kids with an introduction to the piece of music made famous by Rimsky-Korsakov, Flight of the Bumblebee. The story itself is Edwards' interpretation of the music. She weaves a lovely tale of one, Bumble, a bee who just can't seem to get it right. Despite his best efforts, his flapping and zizzing, and all the Queen's orders, he has no sense of direction. Can a kindly Drone's suggestion of flying in time with the music help him? 'Is the King a bee? I thought there were only Queen Bees,' said Bumble. I also like the way Edwards has woven facts about bees into the story, reinforcing what children can learn from observation and from non-fiction texts. Mini Goss's illustrations are perfect for young kids, bright, colourful and quirky. There are lots of font changes that make the story visually appealing too, helping the one who reads aloud, and the young audience. In the back of the book, children can read a little about the composer, and about Flight of the Bumblebee itself, which actually comes from Rimsky-Korsakov's opera, The Tale of Tsar Saltan. If you need to remind yourself of Bumblebee, and really hear those bees buzzing, try this YouTube vid. Hazel Edwards is a much-loved, versatile Australian writer, whose 200 works range from picture books like There's a Hippopotamus on Our Roof Eating Cake, to YA like her recent f2m:the boy within from Ford St. I also have a couple of her excellent nonfiction publications about the craft of writing. 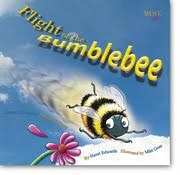 Visit her website to get an idea of her range as an author, and find a very generous Reader's Theatre based on Flight of the Bumblebee, plus some follow-up activities. I would love this book! Our school mascot is the bee, and this would be perfect. I will have to look into these books; thanks for letting me know about them. As soon as I read the title of this post, Flight of the Bumble Bee played in my mind. I love the idea of a story based on music. It would be fun to read this story to students while listening to the music and then have them create a story based on a piece of classical music. Thanks for sharing that book, Callie. I'll keep a beady eye open for it!